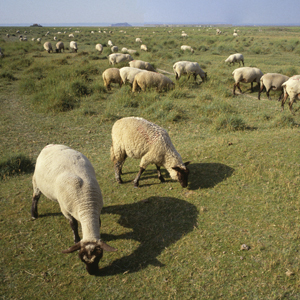 Kay Dee offers protein and mineral supplements for sheep in all phases of production. Our Sheep Etts granular mineral supplies sheep with precise daily nutrient levels for health and productivity. Our Sheep 6 Block contains 6% phosphorous, and provides mineral supplementation for moderate-to-low quality forages. The Sheep 8 Block has 8% phosphorous and is specially formulated to provide optimal levels of vitamins and trace minerals required for all stages of production. Kay Dee’s sheep protein products are second to none, and are of the finest quality. The Kay Dee Sheep Lick 16 is made from all-natural protein, and fortifies late-season forage and winter rations. Available in a 40 lb. or 100 lb. tub, the Sheep Lick 16 is convenient to use. The Kay Dee 20% Sheep & Goat Protein Block also contains no urea, supplements low-quality forage, and helps extend forage grazing. Kay Dee’s new 5 lb. brick is available in both protein and mineral formulations, and makes feeding small herds even easier.